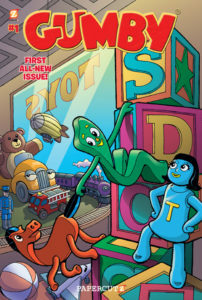 Joe Clokey, President of Premavision/Clokey Productions and son of Gumby creator Art Clokey, is proud to announce that Papercutz, “the #1 Kids’ Graphic Novel Publisher” will launch a series of new comics and graphic novels featuring the legendary character Gumby–the stop-motion animated TV star and top-selling toy. The first issue debuts on July 5, 2017. Papercutz is creating new material based on the original hit Gumby television series. The episodes have found a new generation of fans through TV broadcasts, streaming services, YouTube and DVD releases. Gumby has millions of fans worldwide, and toys, DVDs and other merchandise are sold through mass-market retailers, like Wal-Mart and Target, and specialty stores. This resurgence in popularity is driving the creation of new media. Premavision recently announced development of a new television series (in partnership with the Jim Henson Company) and a feature film. 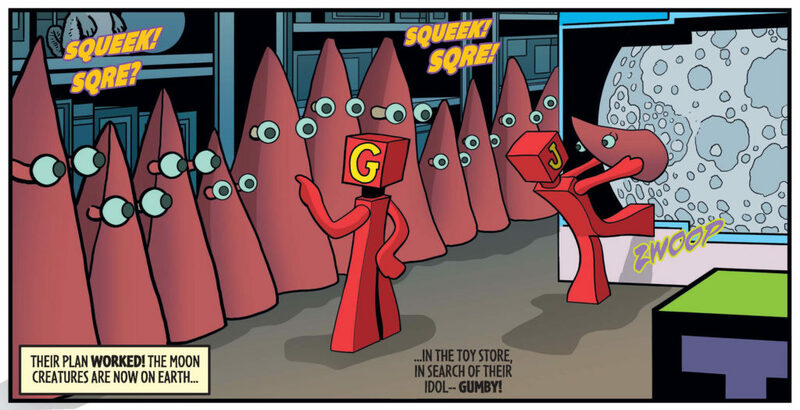 With the recent 60th anniversary of the Gumby TV show, the timing is perfect for the character to return to comics. Read more about Papercutz and the artists. 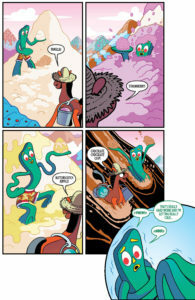 GUMBY #1 will be on sale at comic book stores, online retailers and bookstores everywhere on July 5th.